9ct yellow gold created sapphire cluster ring featuring silver claws. This vintage inspired design will look great teamed with floral prints and lace dresses. 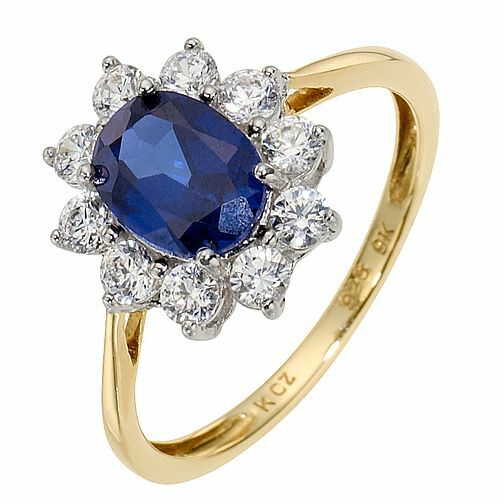 9ct Yellow Gold & Silver Created Sapphire Cluster Ring is rated 4.8 out of 5 by 4. Rated 5 out of 5 by Anonymous from 5* Looked exactly like it did in the picture rearly pleases and arrived early. Rated 5 out of 5 by Anonymous from Stand out looking ring This was to replace my wife's old engagement ring , she is more than happy with this as a replacement .